May the blessing and true meaning of communion be given to all of us. My dear ones, there are some among you who are from liturgical churches and as I have stated before, very clearly, you should continue to receive communion as you always have. This teaching is for non-liturgical believers in Jesus. There's going to be a time in the future when there will be no way to receive communion in a church any longer, during the reign of the AntiChrist, when all churches will be censored. It is the Lord's heart that you should still draw near to Him in communion daily, and although it is not identical with the liturgical churches, communion still has much rich meaning and graces when received with the right heart. He has promised that for you who are not in the liturgical churches, and no longer have any way to receive communion in your church - He still wants to make a provision for you. He will bless this practice with graces that cannot be measured and that He will strengthen you for the journey. I am not here to argue with anyone on the meaning of communion. This is not a channel that discusses doctrine. I am merely giving you the Lord's own words about at least having your own time of intimate communion with Him if you do not wish to associate with liturgical churches. The Lord began, "My People, you must come to communion expecting to receive all of Me. I have given Myself to you under the appearance of bread and wine, but with spiritual eyes you must unmask all the possibilities the sacrament contains. "I did not give you just a little particle. I didn't just give you My Mind and not My Body and vitality. I suffered all those things because I gave you My all. 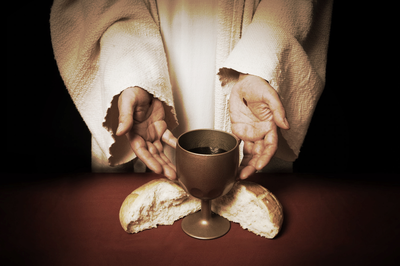 Therefore, you can expect to have My all when you receive Me in communion. If you come expecting little, only a little you will receive. If you come expecting everything I am and have, I will give all that is necessary to you right now in your life. There will not be an overabundance in you, but a perfect balance, if you come expecting all of Me. "You see, there is no such thing as just a little of Me. The tiniest bit contains the entire Trinity and all that comes with the power of God. You do not receive all I can impart to you because you do not expect it, and you are not asking for it, so I am limited by your lack of faith in what I can impart to you, that will be active in your soul. "The fact that you receive the tiniest part of Me means all is given but only a very little bit will be used. The rest is dissipated by your limited perceptions, yet there is much imbedded in you like a seed that grows into maturity when it is needed. That is why I am teaching you this. I have so much more to give you in communion. So much more. But you must prepare yourself worthily to receive it. "I very much approve of the service James wrote in Jerusalem. Never mind which apostate churches use a similar form, please ignore the bath water and keep the baby." Jesus continued, "When he wrote this, it was under the inspiration of My Spirit, and the whole progression of the service was to prepare your hearts to receive Me." I don't have all the facts on this, but I just want to say that - in that day and time, it was the ordained ministers, the ones who'd had hands laid on them by the apostles, that actually celebrated the service of St. James. And these are our roots, our Christian roots, back to Jerusalem in the middle of the 1st century. These traditions and ordinations have been carried out throughout all time, and are still alive now in certain churches. But the great problem is that some of these churches are apostate, and no longer believe as the early Christians did. Nonetheless, this service IS beautiful for preparing your heart to receive Jesus. The Lord continued, "I am not saying you must do all of this religiously, not at all. But I am asking you to capture the progression he laid out, because with it you will be well prepared to receive Me and all I have for you in communion. "This is a solemn service, dear ones. It is the memorial of my Passion, which so few wish to commemorate. What a shame that you shy away from these memories." Oh, Lord, forgive me. It is so painful to recall your passion, it makes my heart sick. "Nevertheless it reminds you of what I suffered for your sins, Clare, and it prepares you to be courageous in facing the trials of your day. Behind that veil of sorrow is limitless joy. You must penetrate that veil into the heart of your God and see the great wonder and joy that was released as I redeemed you out of the slavery of sin and death. "Once you glimpse the joy of My Father's Heart and Mine as well, once you see - truly see and touch that - it will illuminate your being with divine love and make it so much easier for you to be charitable with the faults and shortcomings of others. In fact, your own character will be illuminated so well to you, that you dare not lift your head above others, ever. "I do not say this to shame you, only to keep you in the last place where you have begged Me to keep you. Seeing how I suffered is sobering for you and acts also as an admonition to never complain. Never. And we are having a problem with that, aren't we?" Yes, Lord, forgive me. I am so sorry. I have so much to be grateful for. This pain makes me impatient and kind of crabby. Hopefully, I'll have the grace not to spill over on others with that attitude, but there are a few items that provoke me...little things...and bad habits from my past that spring up through my frustrations. Jesus continued, "Nothing is little when you consider how much I suffered to give you peace and secure a place in Heaven for you. All these little things you grow so impatient with, including the pain, all of them are being used for others. Even as Simon's contribution brought forth much fruit. Though he was not God, he aided Me in My hour of need as I was setting the captives free. And as such, he partakes in the work of the cross as well. "Oh, the Divine economy leaves not one pain fall to the ground without taking root and producing its own fruit, and excludes no one from contributing. And this was to prepare the way for you, My Darling Brides. So that you, too, could have a share in My sufferings, even as they are intensified right now for the whole Earth. "You all will be facing many trials, but if you cleave to Me you will have nothing to fear. "And again returning to the service James wrote. And he did indeed write it. There was not another author other than My Spirit. You can see from the tenor of his writings that he was given to serious contemplation of those things that are most offending and render a man impure. He was acutely aware of the disparity between man's idea of holiness and My idea of holiness and for this reason left many expressions of Mercy in the service. "But moving on, there is a difference between who has the service, in the sense that some are more holy, pure and reverent than others. Those who live their lives totally in My service, caring nothing for the laurels or accolades of the world. Those who spend substantial time in prayer for others and worship. Those who read My Word and study to show themselves approved. Those who give whole-hearted service without condemnation and judgment to the poor. Those who do these things as a way of life, bring more blessings and favor from My Father into a communion service." And again I want to stress that this teaching is for the NON-liturgical churches. It is for people who do not, and cannot be a part of a liturgical church. Jesus continued, "Nonetheless, the service carries great blessings, and it is My desire that you get the very most out of it. As I have shared with you before, confession of sin, and I don't mean a quickie pass-over but a good look and true contrition for offending Me, as a daily practice. Reading from the Old Testament, New Testament, the Psalms, and the Gospels, prepares your hearts for action and gives you the continuity between the old and new covenants. Well rounded, and much to consider. "And I do approve of relinquishing control to My Spirit in choosing the readings, although you will see that I also find ways to highlight things if you follow the chronology of readings. Do as you are led by My Spirit. "But please, come to Me with contrition, expecting that I will forgive and nourish you on this bread of life. I give you all that I am My Bride. Receive Me with great reverence, expecting miracles of grace to be given you."